Right click on the track and hit "Get Info". Under the Options tab, set your Start Time and Stop Time to the correct values for the ringtone and hit OK. Right click on the song and choose "Convert Selection to AAC". If it says "Convert Selection to MP3" or "Apple Lossless" instead, head to iTunes' Preferences, hit Import Settings, and switch it to the AAC Encoder and try again. 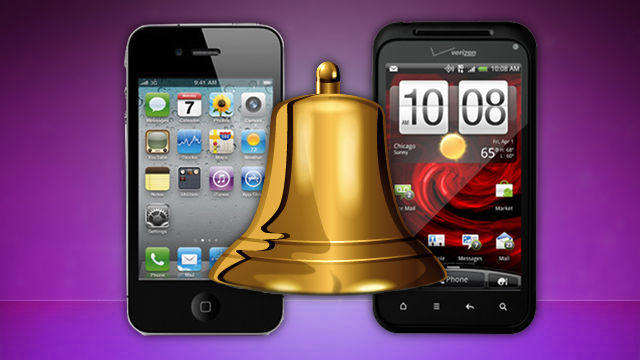 To set the ringtone for your entire phone, just head to Settings > Sound > Phone Ringtone. If you want to set it for a specific contact, you can just open up that contact in the Contacts app, hit the Menu button, choose Options and tap Ringtone. There are many ways to create your own ringtone on both platforms, but these are two pretty simple options that don't require paying money. Just make sure that you keep your phone on silent or vibrate when necessary — there's nothing more embarrassing than being the guy who's pocket starts singing Miley Cyrus in the middle of Starbucks. Got your own preferred ringtone creation method? Let us know about it in the comments below. how is this possible with WP7? You can make ringtones online with http://www.melofania.com, for example. Can't think of a better way to destroy that song you love so much! It's definitely an effective way to do that, but I used this method a while ago to get the Power Rangers wrist communicator noise as my ringtone. So it isn't always a bad thing. On SGSII, play the song you want in the music player -> menu -> set as -> ringtone or caller ringtone. 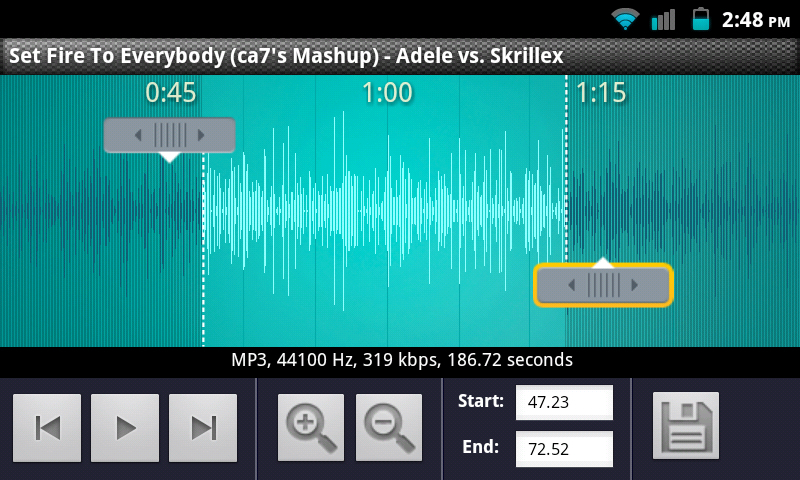 Yer this is much better.. the key thing here is that RingDroid allows you select just the "part of the song" you want. I could already make any song a ringtone but only starting from the beginning of the song. Sure it's not anything you couldn't do with an old audio file editor.. but it's the simplicity of it all that makes it a winner. Seriously, why not use audiko.net? Been around for ages, and lets you use online songs (from youtube) as well as mp3s. Yeah just make it online. Also you can set the txt time in ios5 finally. On a PC I use Audacity. It has a display like Ringdroid that lets you see the volume profile of the whole track. It makes it very easy to see and select the start and stop points for the ringtone that you want to create. On a slight tangent, does anyone know of an MP3 player (Windows, Android or iOS) that has a display like Ringdroid so you can see the volume profile of the whole track on screen at once while the track is playing? As far as I am aware, there are no visualizations in Windows Media Player that do this. They only show what is happening "now" and maybe a bit into the past. If I was being really greedy, I would ask for a second display that showed the frequency profile for the entire track. I use a very simple MP3 editor (MP3Trim) to just chop out the section of a song or soundbite that I want, then drag-drop to my phone in Explorer. It's just a Nokia running S60, shame that more technically advanced and capable phones have to go through a more complicated process. I followed the exact steps above for the iphone, except it didn't work. It still didn't appear under ringtones. Please help. Tried this over and over-- it puts the file in the iTunes "Tones" folder, which plays when I double click on it, but it just simply doesn't download it when I sync. Any thoughts?